How To Create a Successful Website That Attracts Millions of Visitors! Over the years, thousands of people have asked us, how did we create this website and how can they create their own. Today, I would like to share with you, the simple strategy we use to build our websites, get millions of visitors and earn income on autopilot. Our techniques have been proven to work successful in many industries for us and for other people. In some ways, you can consider what I’m about to share with you, your own blueprint to creating your first successful website. How successful… well, I will leave that to you to decide. For each step, I will outline the most important tips and techniques we use. But, before you can get started, you need to decide what your website is going to be about. As for figuring out this, well what are you passionate about? What is your greatest area of knowledge? How can you help people? Know the answer to this question? Then you are ready to begin. Once you have your big idea, the first few steps you are going to take are very simple. You are going to brainstorm a name, register the .com and then get some hosting for it. After that, you will install your website software (in only a matter of a few clicks), followed by adding 1 of thousands of great designs available to you at the click of a button. This website software, called WordPress, which I’m sure, most of you are well aware of, is not only far superior to anything else I’ve seen, but it’s also easy to use, oh and did I mention, it’s free. WordPress originated as a blogging software, but over the years, it’s now more widely used to create any number of type of website, from an online store, to a sales page and of course, it’s used to publish content. Content, was the first thing we focused on when we create a website. It’s one of the biggest reasons for our success and that’s why I recommend you also focus on it. Before you can expect to make any money, you have to attract people to your site and the best way we have found to do this, is to offer great free content. Before you do anything, you must decide on a name for your website and purchase your .Com (or .co.uk. .org .net etc). I have a lot of domains, how I come up with the domains is simple. They are descriptive of what the site is about, so for example, ExpertPhotography.com is about how to become an expert at photography. When my friend approached me to help him come up with a domain for an outsourcing site, I asked him, whats the goals of your blog? He told me it was to save entrepreneurs time by outsourcing. I recommended he named his site SaveTimeOutsource.com and that is what he went with. Personally, I would only go for a .Com (it’s the most popular & easiest to remember) and I would also keep the name as short as possible. To register your domain, go to a website called NameCheap. A domain will set you back less then $10 a year and is one of the most important things to get right. Of course, feel free to shop around and choose a different registrar, the only main difference between companies is the level of customer support. Your on my website right now, to do this, I have to host it on a server so that people can come and visit it. To do this, you rent some space on a server for around $5 a month and can put all your files on it and thousands of people can come and visit it without any hassle. I personally recommend to start with, you use HostGator. They have 24/7 live support with agents who will always be happy to help you with any issue you may have. One of the main reasons why I recommend hosting with HostGator, is because they have a tool in their user control panel called QuickInstall, which allows you to install WordPress (website software) with one click. When ordering your hosting, use coupon code: incomediary25 to get 25% off your order. Now that you have a domain and web hosting, you have to let them know you want to use the two together. You do this with Nameservers. When you purchase your hosting from HostGator, they will email you two nameservers. You then login to GoDaddy, edit your domain settings and type in your nameserver address. Then your domain and hosting will be connected. Here is a selection of well known hosting companies you can choose between. Switching Hosts? If you are thinking about switching to a new web host, NameCheap and HostGator offer a free migration service. This means, they will transfer everything from your old host, to their service. Next I will show you how to install your website in less than 30 seconds for FREE, something I have seen programmers charge as much as $500 to do. I recommend everybody uses WordPress to run their website. It’s the most popular website platform and is used by more than half of all new websites. I use it and it doesn’t matter if a site is big or small, it’s the best choice. Back when I started, installing website software would be no easy task. You would have to upload thousands of files and learn lot’s of technical stuff, which no one wants to do. However, now all you need to do is login to your hosting control panel and click QuickInstall >> Install WordPress, less then 30 seconds later your blog is installed, you have a website on the internet and you can start publishing content. By using WordPress, you are now able to use over 100,000 already created blog designs. Some free and some much better that come at a small cost. Once you have chosen and downloaded your blog theme, you need to log into your WordPress admin area. Then click Appearance on the left side, then click Themes. Click upload, find your theme and once installed, active it. If you want to hire a designer to create a logo or website design, you could use Fiverr. With most good blog themes, you get a custom dashboard to edit the look and feel of the theme. On the left hand side of your WordPress admin area, click the blue button with the name of your theme on it. In here you can edit almost everything, it’s all very self explanatory, go through it and make the changes you want. Next, click on Appearance >> Widgets on the sidebar. Here you can move things around, adding, editing and removing widgets on your blog. A widget is like a gadget or an attachment. Something not required for the site to function but can be used to improve it in some way. An example of a widget could be, an advert, an email signup box or popular posts. This is a typically look I go for when I create every new blog, including IncomeDiary. I keep it simple, I make it usable. Then once the site proves itself, I invest more money and time into it. This way, I risk little up front, but using a few great resources, still manage to build a professional looking site. The majority of our website traffic comes from Google. To rank high in Google, you need to work on your websites search engine optimization. Install Yoast SEO Plugin for WordPress. Choose your permalink settings, I recommend /%postname% – this will mean your blog posts URL’s will display as domain.com/postname – a lot of bloggers include category or date in permalink, but this is not something I would recommend because it makes it difficult to change categories or dates as it will change the URL. Research keywords using Ahrefs. Keywords are the search terms you want to rank for in Google. Ahrefs tells you which keywords get what amount of traffic. Make sure to add links in posts to other pages on your site and other peoples sites in posts. This helps Google figure out what your content is about and helps reduce bounce rate. Add a sitemap to your website. Don’t have broken links on your website. Make sure your website is as fast as possible. Google ranks websites higher for having HTTPS / SSL websites. Some web hosts offer this for free. We have a lot of articles about creating content. I would say, 80% of getting traffic to your website is about creating the best content possible. Do keyword research. If you choose keywords that no one is searching for, then you shouldn’t expect people to find your articles. Above you can see a screenshot from Ahrefs. Using this post as an example, I searched for “How to create a website”. You can see in the top right corner, that it gets 119,000 searches a month. That’s a lot of traffic! Perhaps to much traffic because the more traffic a search term gets, usually means the harder it is to rank for. On the left side you can see that I will need 259 websites to link to this article to rank in the top 10. Now this is a lot because it’s a very competitive search term, but it’s not impossible. 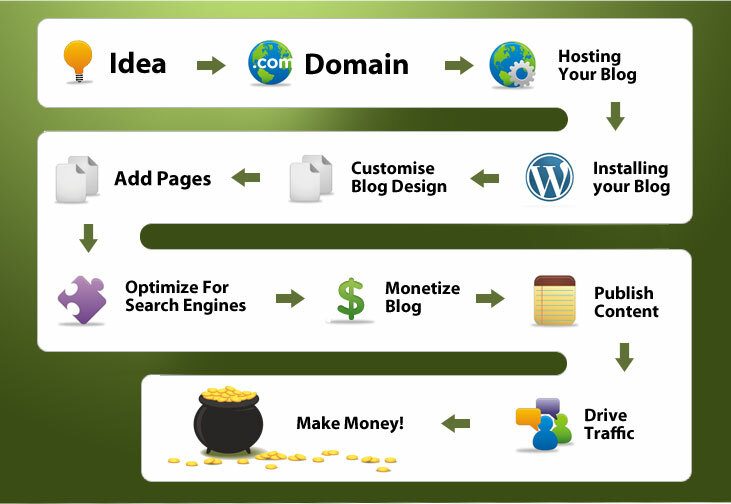 Getting backlinks is mainly down to creating great content. If you can create better content then anyone else that ranks for the same search term, then you have a good chance of ranking high in Google. If you don’t want to write content yourself, you can hire writers on Fiverr. In our experience, the best way to monetize a website is to create and sell your own products. However, when you first start your website, this is often not possible because you need to spend most of your time creating content. What I would suggest to anyone with a new website is, build an email list and focus on monetizing your website with affiliate links. An email list lets you collect emails from readers so that you can email them later. Affiliate marketing is when you promote someones product and receive a commission when people buy through your link. To get a good idea of all the different ways to monetize a website, check out this guide for making money online. Now you have set up your website, it’s time to learn and implement the things that will drive traffic to your website and make you money. Content is why someone visits your website, creating great content will mean more people will visit your website. Would you still be reading this website if it wasn’t for the great content? NO! Write well and people will come. What is the point of creating a website if no one visits it apart from yourself and a few close friends. I have published some great posts about how to drive traffic to your blog. Without traffic, you can’t make money, without great content, people won’t stay long enough to earn you money. Do you see how this is all coming together? I create websites because it’s my passion but I don’t think I would enjoy it as much if I didn’t make so much money from it. Here are my favorite articles related to making money from a website. I’m a perfectionist and I know every improvement I make is going to mean more traffic to my website which in turn will make me even more money, here are some posts to help you make improvements. We all struggle to keep motivated, personally I’m at the point with my business where I don’t have any financial worries so it’s hard for me to find a reason to keep working because to be honest with you, I don’t. I do however because I’m motivated by success, you may be the same or you may not be making money yet and want to get to this point. Here are my favorite posts to inspire and motivate you to keep pushing forward.